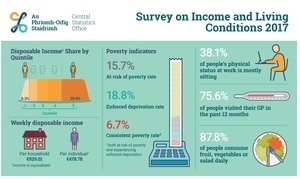 The Central Statistics Office published its results from a survey on income and living conditions in Ireland in 2017. It found the mean annual household disposable income in 2017 was €48,476 which represents a 4.7% increase on the 2016 figure of €46,310. The at risk of poverty rate, which is the share of persons whose equivalised income was less than 60% of the national median equivalised income, was 15.7% compared with 16.2% in 2016. This change is not statistically significant. Enforced deprivation is defined as not being able to afford two or more deprivation indicators; such as keeping the home adequately warm or buying presents for family/friends at least once a year. The percentage of people considered to be experiencing enforced deprivation was 18.8%, down from 21.0% in 2016; this is a statistically significant change. The most common types of deprivation experienced by Irish households were an inability to afford to replace worn out furniture (20.4%), to afford to have family or friends for a drink or a meal once a month (13.9%) and to afford a morning, afternoon or evening out in the last fortnight (13.2%). Finally, the consistent poverty rate which includes those persons who are defined as being both at risk of poverty and who are also experiencing enforced deprivation, was 6.7%. This is also a statistically significant change on the 2016 figure of 8.2%. Posted in Misc and tagged CSO, Survey on Income and Living Conditions 2017 at 2:28 pm on December 17, 2018 by Bodger. Ireland exported €123 billion of goods in 2017 and imported €79 billion. We exported €17 billion more to the USA than we imported in 2017. 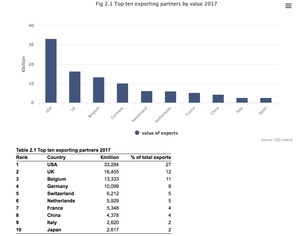 The UK was our largest import partner in 2017 at €18.8 billion and was also our largest partner for both exports (€4.6 bn) and imports (€3.7bn) of food and drinks. 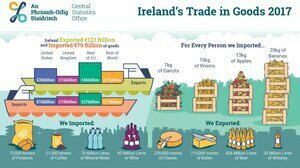 In total, Ireland exported €12.3 billion and imported €7.7 billion of food and drinks in 2017. We imported 20kg of bananas, 13kg of apples, 10kg of onions and 7kg of carrots for every person in Ireland. Posted in Misc and tagged CSO, trade 2017 at 11:29 am on December 4, 2018 by Bodger. You may recall how the Census 2016 figures which showed 183,312 vacant houses in Ireland – excluding vacant holiday homes. “… the real number of unoccupied houses and apartments might only be a tiny fraction of that, if the results of an investigation carried out by Fingal County Council are replicated elsewhere. Rob Kitchin, on his Ireland After Nama blog, has looked at this story, acknowledging he couldn’t locate the Fingal County Council report or press release. ‘The council initially conducted a desktop exercise on the 3,000 supposedly vacant properties. When commercial properties, as well as those in construction or in the planning process, were eliminated the figure fell to 361 properties.’ They then visited 74 of the 361 homes to check on occupancy, though it’s not stated how those 74 were sampled. Of those 74 visited, they discovered that only 13 were actually vacant. In other words, rather than having a vacancy rate of 5% (as reported in the 2016 census – 4,944 vacant units + 289 holiday homes), they have a rate of about 1% – far below what might be an expected base vacancy level of 6% (there are always some units vacant due to selling, gaps between renting, working temporarily elsewhere, people in healthcare, etc.). I have no doubt in the 18 months since the census in April 2016 properties that were vacant will have been occupied, however it seems unlikely that vacancy is so far below base vacancy, which is what the IT piece seems to be suggesting. 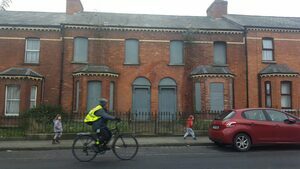 “In terms of method it is unlikely that the CSO shared the individual addresses of vacant properties as identified in the census with Fingal. “But if they were working from census data then it does not include commercial properties, nor properties under-construction, or in the planning process, or derelict. 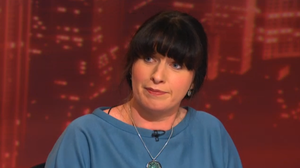 “So removing those properties from census counts would make no sense – they were never counted by the CSO. Indeed, in a rebuttal story in the Irish Times, the CSO stand over their data and method – which is to send enumerators to every property in the country, to visit upwards of ten times if they fail to get an answer, and to talk to neighbours to try and ascertain the use status. 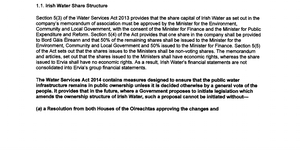 “…In my view, there needs to be a branch-and-root review of property data in Ireland. “This needs to start with asking the question: what data do we need to generate to best understand planning, housing, commercial property, infrastructure need, etc? “…With good quality data that people trust we might avoid different agencies producing wildly estimates of some element of housing or commercial property, such as vacancy rates, and we would greatly aid our planning and economic development. Posted in Misc and tagged CSO, Housing, Rob Kitchin, vacancy rates at 10:33 am on September 15, 2017 by Broadsheet. In the year to July, residential property prices at national level increased by 12.3%. This compares with an increase of 11.5% in the year to June and an increase of 7.1% in the twelve months to July 2016. In Dublin, residential property prices increased by 12.7% in the year to July. Dublin house prices increased 12.6%. Apartments in Dublin increased 12.0% in the same period. The highest house price growth was in Dublin City, at 13.6%. In contrast, the lowest growth was in Fingal, with house prices rising 7.4%. 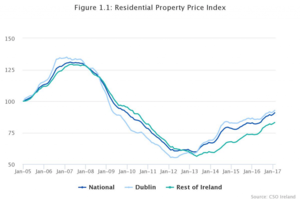 Residential property prices in the Rest of Ireland (i.e. excluding Dublin) were 11.7% higher in the year to July. House prices in the Rest of Ireland increased 11.8% over the period. The West region showed the greatest price growth, with house prices increasing 15.8%. The Mid-West region showed the least price growth, with house prices increasing 8.2%. Apartment prices in the Rest of Ireland increased 13.7% in the same period. Posted in Misc and tagged 12.3%, CSO, house prices at 1:27 pm on September 12, 2017 by Broadsheet. The Central Statistics Office released new figures in relation to the movement of the population within Ireland. In April 2016, 44% of the State’s total urban population lived in Dublin, while 11% lived in Cork. Sligo was the county with the biggest change in the rate of urbanisation, increasing from 37% to 40% over the five years. Forty-one towns had a population of 10,000 or more, with 27 in Leinster, nine in Munster, three in Connacht and two in the three Ulster counties. 62.7% of the population lived in urban areas in April 2016. 37.3% of the population lived in rural areas in April 2016. 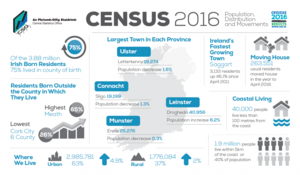 The largest rural population increase was in County Cork with 6,946 persons followed by Kildare which saw its rural population increase by 4,025 persons. Drogheda, with a population of 40,956 (up 6.2% since April 2011) remained the largest town in Ireland. Swords (39,248) and Dundalk (39,004) complete the top three. Ennis (25,276 persons) remained the largest town in Munster. Sligo with 19,199 persons was Connacht’s largest town, while Letterkenny (19,274 persons) was the largest town in the three Ulster counties. The latter three towns experienced a slight decline in population since April 2011. …263,551 usual residents (aged one year and over) moved in the year up to April 2016, down 3.5% on the 2011 figure of 273,239. 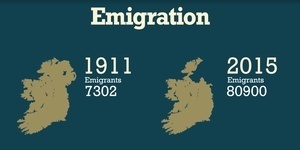 Of these, 94,182 moved in Dublin, with 18,716 moving out of the county. The top destinations were Kildare, Meath and Wicklow. The number of households moving in the year up to April 2016 fell by 4% to 110,204. Posted in Misc and tagged CSO, movement, population at 2:44 pm on May 11, 2017 by Broadsheet. In the year to February, residential property prices at national level increased by 10.7%. This compares with an increase of 8.1% in the year to January and an increase of 5.4% in the twelve months to February 2016. In Dublin, residential property prices increased by 8.3% in the year to February. Dublin house prices increased 8.1%. Whereas apartments increased 9.1% in the same period. The highest house price growth was in Dublin City, at 9.2%. In contrast, the lowest growth was in Fingal, with house prices rising just 3.7%. 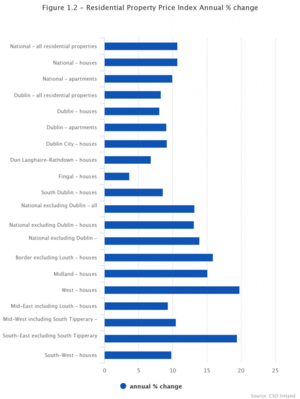 Residential property prices in the Rest of Ireland (i.e. 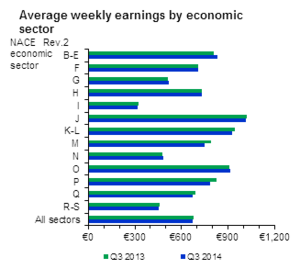 excluding Dublin) were 13.2% higher in the year to February. House prices in the Rest of Ireland increased 13.1% over the period. The West region showed the greatest price growth, with house prices increasing 19.8%. In contrast, the Mid-East region showed the least price growth, with house prices increasing 9.3%. Apartment prices in the Rest of Ireland increased 13.9% in the same period. Posted in Misc and tagged CSO, Property Prices at 1:32 pm on April 19, 2017 by Broadsheet. With olde timey piano music. Posted in Misc and tagged CSO at 11:40 am on March 10, 2016 by Broadsheet. 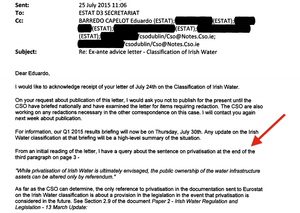 Posted in Misc and tagged Cancellations, CSO, Eurostat, Irish Water at 10:06 am on September 7, 2015 by Broadsheet. Michelle Murphy, from Social Justice Ireland, summarised the CSO survey on income and living conditions in Ireland last night. – The median disposable income for an individual – after tax and after social welfare transfers – is just €17,374. This has dropped from €20,681 in 2008. – One in eight children is living in poverty. – 60% of those children is living in consistent poverty. 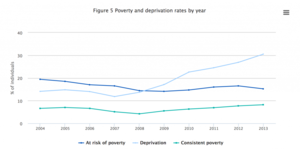 – As a whole, consistent poverty has doubled since 2008. – There 698,000 people in Ireland who are living on incomes below the poverty line, in other words living on an income of under €10,425 a year. 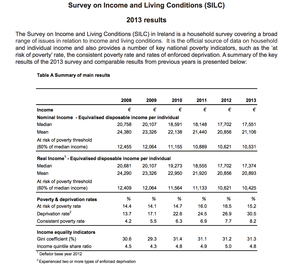 – 91,000 people who have a job are living on an income below €10,425 a year, otherwise known as the ‘working poor’. – If Ireland didn’t have social welfare, half the population would receive below €10,425 per year. Posted in Misc and tagged CSO, Survey on income and living conditions 2013 at 10:41 am on January 22, 2015 by Broadsheet. 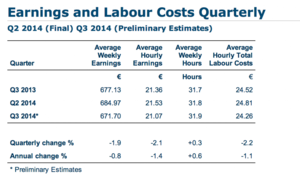 Posted in Misc and tagged Average weekly earnings, CSO at 12:45 pm on November 25, 2014 by Broadsheet.